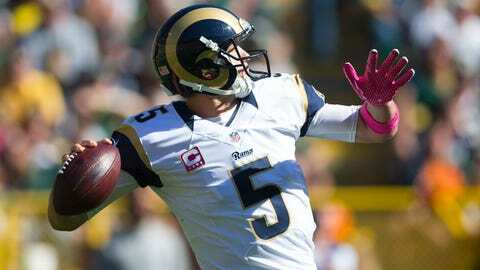 Nick Foles is trying to work out some wrinkles in a Rams offense that has been inconsistent. ST. LOUIS — For some veterans, the bye week is a chance to relax and refresh their body. For Rams quarterback Nick Foles, it’s a time to get better. "There’s always a lot of things you can learn from," Foles said. "Developing character, you learn from your mistakes. It’s just how do you learn from those things? I look at them critically and I want to get back on the practice field and improve on the things I didn’t do well. This time is very valuable." There was plenty of learning to be gained from the Rams’ 24-10 loss at Green Bay on Sunday. Foles threw for 144 yards, one touchdown and four interceptions. His 23.8 quarterback rating was the lowest of his career. With two rookies and three new starters on the offensive line, and with Foles learning offensive coordinator Frank Cignetti’s system, some growing pains were expected. "I want to keep improving every day," Foles said. "I am where I am right now, but I want to keep getting better. I want to keep building, keep improving. The big thing is just being consistent every week and putting us in a situation where we can win the game." Coach Jeff Fisher said Foles has already put the Green Bay game behind him. "He’s just become more and more familiar with our system and our players and he’ll continue to improve," Fisher said. "So, by no means has he peaked." The Rams’ offense has been inconsistent. St. Louis (2-3) put up 34 and 24 points, respectively, in wins over Seattle and Arizona, but scored 26 total points in its three losses. "I think for our young guys, it’s great to get those games in and then during the bye week sort of let it digest and step back for a second and look at what you did, look at what you can improve on, and keep going," Foles said. Foles is 81 for 141 for 956 yards with six touchdowns and five interceptions. His demeanor has left an impression on his teammates. "Even when things aren’t going well, you won’t see him on the sidelines pouting," linebacker James Laurinaitis said. "He’s not an ‘I’m going to get down because I threw a pick,’ he really just forgets about it and goes out there the next drive and believes the next drive is going to be a success. "I think in the long run, it’s going to help us. When you have a QB that’s even-keel like that, it gives the guys around him more confidence." Tackle Greg Robinson said Foles quickly took over the offense after being traded from Philadelphia for Sam Bradford in the offseason. "He doesn’t really talk much, but he leads in his own little way," Robinson said. "I commend him greatly, because he just came in and took over the team not really knowing what to expect." That leadership doesn’t end simply because the Rams have Sunday off. Foles is just as busy this week as he will be next week as the Rams prepare to host Cleveland. "We can go back and self-scout and really improve on things as an offense, me as a player," Foles said. "That’s what you use the bye week for. Right now, we’re utilizing that and using it to our advantage. So far, it’s been a very productive week for us. "I’m learning more and more every day. As long as I play this game, I’ll keep learning."